Boeing on Friday issued 429 new layoff notices to union members in Washington State. It’s likely further notices were issued to non-union employees, though Boeing won’t disclose the figure. Altogether 217 members of the International Association of Machinists (IAM) got layoff notices Friday and 277 were issued to members of the white-collar Society of Professional Engineering Employees in Aerospace (SPEEA), the two unions confirmed. The IAM layoff notices are the second batch for that union’s members this year — 111 people received notices in March. Adjusting for those who had already received notices last month, the number of new layoff notices issued to the IAM was 152, which makes a total of 263 so far this year. Also Friday, about 1,000 Machinists who took an earlier buyout offer left the company for the last time. Another 500 who took the buyouts will leave in the months ahead. Boeing vice president of engineering John Hamilton warned on Monday that “hundreds of engineering employees” would get notices of layoff on Friday. Friday’s SPEEA total breaks down to 194 engineers and 83 technical staff, said union spokesman Bill Dugovich. Of those, he said 246 are in the Commercial Airplanes unit, 30 work on the company’s defense side and one works on a corporate unit. Geographically, 191 of the engineering layoffs were in Everett, 35 in Renton and 26 in Tukwila, with smaller numbers at other Puget Sound area locations, Dugovich said. It’s likely more layoff notices also went out to non-union employees, but the company will not disclose any figures. The 60-day notices specify that the layoffs will happen in late June. Jon Holden, president of IAM District 751, said the union’s main concern is that the looming production rate cut on the 777 assembly line, set for August, will mean significantly more layoffs later in the year. 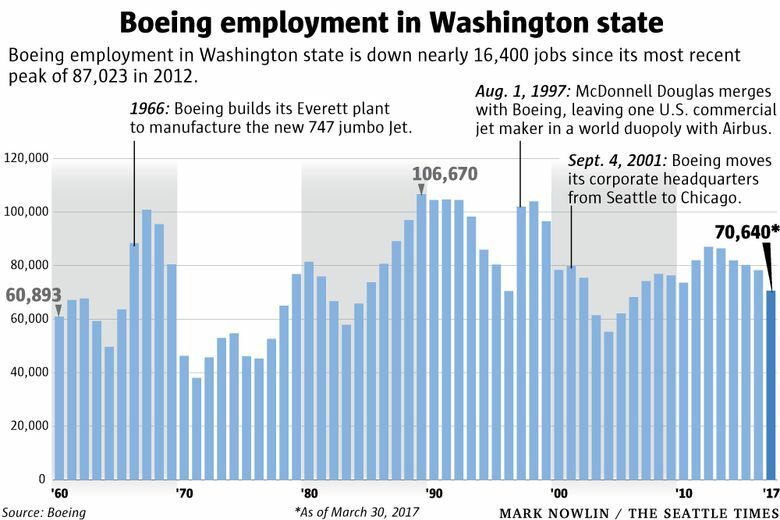 Boeing announced in December that it would cut the Everett assembly plant’s 777 production rate from seven planes per month to five per month beginning in August. Shortly afterward, Boeing’s local leadership warned employees that it would need “to continue to reduce the size of our workforce” in 2017.